Ashok K. Goel is a Professor of Computer Science and Cognitive Science in the School of Interactive Computing at Georgia Institute of Technology. He is Director of the School’s Ph.D. Program in Human-Centered Computing, and Coordinator of the faculty consortium on Creativity, Learning & Cognition. He is Director of the School’s Design & Intelligence Laboratory and a Co-Director of Georgia Tech’s Center for Biologically Inspired Design. He is affiliated with the GVU Center, the Institute for People and Technology, the Robotics and Intelligent Machines Center, the Center for 21st Century Universities, and the Health Systems Institute. Ashok conducts research into human-centered computing, artificial intelligence and cognitive science, with a focus on computational design, discovery, and creativity. The goals of his research are to understand human creativity in conceptual design of complex systems as well as scientific problem solving, to develop interactive tools for aiding people in such creative tasks, and to invent computational systems that are themselves creative. His research explores analogical thinking, systems thinking, visual thinking, and meta-thinking as fundamental processes of design, discovery and creativity. His current projects explore analogical thinking and systems thinking in biologically inspired engineering design, visual thinking on intelligence tests, and meta-thinking in game-playing agents. A related project focuses on systems thinking and meta-thinking in learning about ecological systems in middle school science and about biological systems in interdisciplinary education in biologically inspired design. Ashok typically teaches the CS 4635/CS 7637 course on Knowledge-Based Artificial Intelligence in the fall term of each year. In the spring term, he alternates between teaching the the CS 4610/CS 7615 course on Computational Creativity, the interdisciplinary graduate course CS 6795 on Cognitive Science, and the new interdisciplinary undergraduate GT 2803 course on Invention. Ashok is a member of the Organizing Committee of the conference series on Advances on Cognitive Systems, and the Steering Committee of the conference series on Theory and Application of Diagrams. In 2013, we was a member of program committees of several conferences, workshops and symposia, including the Sixteenth International Conference on AI in Education (AIED 2013) in Memphis, Tennessee, the Thirty Fifth Annual Meeting of the Cognitive Science Society (CogSci 2013) in Berlin, Germany, and the Nineteenth International Conference on Engineering Design (ICED 2013) in Seoul, Korea. In 2013, he gave an invited talk to the Twenty First International Conference on Case-Based Reasoning in Saratoga Springs, New York, and was a panelist at the Biomimicry 3.8 Seventh Education Summit and Global Conference in Boston, Massachusetts. He is scheduled to give talks at the Dept. of Cognitive Science at University of California at San Diego, the San Diego Zoo’s Conference on Bioinspiration, the College of Life Sciences at Arizona State University, the AAAI 2013 Fall Symposium on Discovery Informatics, and the Second Conference on Advances in Cognitive Systems. 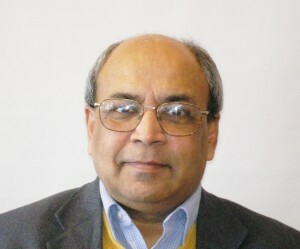 Ashok is an Associate Editor of IEEE Intelligent Systems, ASME Transactions: Journal of Computing and Information Science in Engineering (JCISE), Artificial Intelligence for Engineering Design, Analysis and Manufacturing (AIEDAM), Biologically Inspired Cognitive Architectures, and Advances in Cognitive Systems. He also serves on the editorial boards of AAAI’s AI Magazine, Journal of Experimental and Theoretical Artificial Intelligence (JETAI), Advanced Engineering Informatics (AEI), and Design Creativity and Innovation. Ashok serves on the Board of Directors of the Biomimicry 3.8 Institute, and is a member of BID Community Think Tank that publishes the Bioinspired! digital magazine. He is a life member of the Association for Advancement of Artificial Intelligence, and a member of ACM, IEEE, ASME, the Cognitive Science Society and the Design Society SIG on Design Creativity. Ashok recently co-edited the first ever book on computational methods and tools for biologically inspired design. In 2011, his Design & Intelligence research laboratory developed one of the first interactive tools on the web for supporting biologically inspired design; Here is a short video describing the DANE interactive tool. Ashok’s TEDx talk in 2012 summarizes some of his research on AI for biologically inspired design and environmental sustainability. Gautam (19), a junior in the Honors Program at Georgia Tech with a double major in Mathematics and Computer Science, and a recipient of the 2013 Goldwater Award. Aug 15, 2015: Will AI Take Over the World? Goel, A. K., & Diaz-Agudo, B. (2017). What's Hot in Case-Based Reasoning. In AAAI (pp. 5067-5069). Goel, A. K. (2015). Geometry, Drawings, Visual Thinking and Imagery: Towards a Visual Turing Test of Machine Intelligence. Goel, Ashok K. "Geometry, Drawings, Visual Thinking and Imagery: Towards a Visual Turing Test of Machine Intelligence." AAAI Workshop on Beyond the Turing Test. Austin, Texas, USA. Fitzgerald, T., McGreggor, K., Akgun, B., Thomaz, A., & Goel, A. K. (2015). Visual Case Retrieval for Interpreting Skill Demonstrations. In Proc. of the Twenty-Third International Conference on Case-Based Reasoning. Frankfurt, Germany. September, 2015. Goel, A. K., McAdams, D. A., & Stone, R. B. (ed.). (2014). Biologically Inspired Design: Computational Methods and Tools. To appear - Springer-Verlag, London. Yen, J., Helms, M., Goel, A. K., Tovey, C., & Weissburg, M. (2014). Adaptive Evolution of Teaching Practices in Biologically Inspired Design. To appear - Biologically Inspired Design: Computational Methods and Tools, A. K. Goel, D. McAdams & R. Stone (editors), Springer. pp. 153-199. Stone, R. B., Goel, A. K., & McAdams, D. A. (2014). Charting a Course for Computer-Aided Bio-Inspired Design. To appear - Biologically Inspired Design: Computational Methods and Tools, A. K. Goel, D. McAdams & R. Stone (editors), Springer. pp. 1-16. Joyner, D. A., Goel, A. K., & Papin, N. (2014). MILA-S: Generation of agent-based simulations from conceptual models . In Proceedings of the 19th International Conference on Intelligent User Interfaces. Haifa, Israel. pp. 289-298. McGreggor, K., & Goel, A. K. (2014). A Computational Strategy for Fractal Analogies in Visual Perception. Computational approaches to analogical reasoning - Current trends, Prade, H. & Richard, G. (eds). Springer Publishing Company, Inc.
McGreggor, K., & Goel, A. K. (2014). Confident Reasoning on Raven’s Progressive Matrices Tests. In Proc. of the Twenty-Eighth AAAI Conference on Artificial Intelligence. Québec City, Québec, Canada. July, 2014. McGreggor, K., & Goel, A. K. (2013). Fractal Representations and Core Geometry.. Proceedings of the 2nd conference of Advances in Cognitive Systems, 2013. 3-20. Goel, A. K., Rugaber, S., Joyner, D. A., Vattam, S., Hmelo-Silver, C., Jordan, R., Sinha, S., Honwad, S., & Eberbach, C. (2013). Learning Functional Models of Aquaria: The ACT Project on Ecosystem Learning in Middle School Science. International Handbook of Metacognition and Learning Technologies, R. Azevedo & V. Aleven (editors). Springer International Handbooks of Education Volume 28, 2013, pp 545-559. Helms, M., & Goel, A. K. (2013). Grounded Knowledge Representations for Biologically Inspired Design. In DS 75-6: Proceedings of the 19th International Conference on Engineering Design (ICED13), Vol. 6, pp. 351-360. Design Society. Goel, A. K. (2013). Biologically inspired design: A new program for computational sustainability. Goel, Ashok K. "Biologically inspired design: A new program for computational sustainability." IEEE Intelligent Systems 28, no. 3 (2013): 0080-84. Goel, A. K. (2012). Analogical Thinking, Systems Thinking, Visual Thinking and Meta Thinking: Four Fundamental Processes of Design Creativity. In Proceedings of the Design Society's SIG Design Creativity Workshop, College Station, Texas. Helms, M., & Goel, A. K. (2012). Analogical Problem Evolution in Biologically Inspired Design. In Proceedings of the Fifth International Conference on Design Computing and Cognition, College Station, Texas. Goel, A. K. (2012). New Opportunities for AI EDAM: Ecological Systems and Biological Designs. AI EDAM, Special Twenty Fifth Anniversary Issue, 26(1): 13. Eberbach, C., Hmelo-Silver, C., Jordan, R., Sinha, S., & Goel, A. K. (2012). Multiple Trajectories for Understanding Ecosystems. In Proceedings of the Tenth International Joint Conference on the Learning Sciences, Sydney, Australia, July 2012. McGreggor, K., & Goel, A. K. (2012). Fractal Analogies for General Intelligence. In Proceedings of the Fifth Conference on Artificial General Intelligence (AGI-12), Oxford, UK. McGreggor, K., & Goel, A. K. (2011). Finding the Odd One Out: A Fractal Analogy Approach. In Proceedings of the Eighth ACM Conference on Creativity and Cognition, Atlanta, GA, pp. 289-298. Lee, C., Kolodner, J., & Goel, A. K. (2011). Creative Design: Scaffolding Creative Reasoning and Meaningful Learning. Educational Technology and Society, Special Issue on Creative Design, 14(1): 1-2. Hayes, C., Goel, A. K., Tumer, I., Agogino, A., & Regli, W. (2011). Intelligent Support for Product Design: Looking Backward, Looking Forward. ASME Journal of Computing and Information Science in Engineering, 11(2), 21007. Goel, A. K., & Davies, J. (2011). Artificial Intelligence. In Cambridge Handbook of Intelligence (3rd Edition), R. Sternberg and S. Kaufman (Eds.). pp. 468-484. Yen, J., Weissburg, M., Helms, M., & Goel, A. K. (2011). Biologically Inspired Design: A tool for interdisciplinary education. In Biomimetics: Nature-Based Innovation, Y. Bar-Cohen (editor), Taylor & Francis. Vattam, S., & Goel, A. K. (2011). Foraging for Inspiration: Understanding and Supporting the Online Information Seeking Practices of Biologically Inspired Designers. In Proceeedings of the ASME DETC Conference on Design Theory and Methodology, Washington DC,. pp. 177-186. Vattam, S., & Goel, A. K. (2011). Model-based Tagging: Promoting Access to Online Texts on Complex Systems for Interdisciplinary Learning. In Proceedings of the 11th IEEE International Conference on Advanced Learning Technologies, Athens, GA. pp. 375-377. Vattam, S., & Goel, A. K. (2011). Semantically Annotating Research Articles for Interdisciplinary Design. In Proceedings of the 6th International Conference on Knowledge Capture . Banff, Canada, June 2011. pp. 165-166. Helms, M., Vattam, S., Goel, A. K., & Yen, J. (2011). Enhanced Understand of Biological Systems Using Structure-Behavior-Function Models. In Proceedings of the 11th IEEE International Conference on Advanced Learning Technologies, Athens, GA. pp. 239-243. Vattam, S., Goel, A. K., Rugaber, S., Hmelo-Silver, C., Jordan, R., Gray, S., & Sinha, S. (2011). Understanding Complex Natural Systems by Articulating Structure-Behavior-Function Models. Educational Technology & Society , Special Issue on Creative Design, 14 (1), pp. 66-81. Vattam, S., Goel, A. K., & Rugaber, S. (2011). Behavior Patterns: Bridging Conceptual Models and Agent-Based Simulations in Interactive Learning Environments. In Proceedings of the 11th IEEE International Conference on Advanced Learning Technologies, Athens, Georgia, USA, July 2011. pp. 139-141. Sinha, S., Hmelo-Silver, C., Eberbach, C., Honwad, S., Jordan, R., Rugaber, S., & Goel, A. K. (2011). Understanding the Why and Uncovering the How; Transfer of Conceptual Representations. 2011 Annual Meeting of AERA, New Orleans, LA. Joyner, D. A., Svoboda, J., Goel, A. K., Rugaber, S., Hmelo-Silver, C., & Jordan, R. (2011). Evolution of an Integrated Technology for Supporting Learning about Complex Systems. In Proceedings of the 11th IEEE International Conference on Advanced Learning Technologies, Athens, Georgia, USA, July 2011. pp. 257-259. Honwad, S., Hmelo-Silver, C., Jordan, R., Sinha, S., Eberbach, C., Goel, A. K., & Rugaber, S. (2011). Learning about Ecosystems in a Computer Supported Collaborative Learning Environment. In Proceedings of the Ninth International Conference on Computer Supported Collaborative Learning (CSCL), Hong Kong. Hmelo-Silver, C., Jordan, R., Honwad, S., Eberbach, C., Sinha, S., Goel, A. K., Rugaber, S., & Joyner, D. A. (2011). Foregrounding Behaviors and Functions to Promote Ecosystem Understanding. In Proceedings of the Ninth Hawaii International Conference on Education (HICE). pp. 2005-2013. Goel, A. K., Sinharoy, A., Adams, S., & Dokania, A. (2010). Interactive Story Authoring for Knowledge-Based Support for Investigative Analysis: A Second STAB at Making Sense of VAST Data. GVU Technical Report GIT-GVU-10-02. Sinha, S., Gray, S., Hmelo-Silver, C., Jordan, R., Honwad, S., Eberbach, C., Rugaber, S., Vattam, S., & Goel, A. K. (2010). Appropriating Conceptual Representations: A Case of Transfer in a Middle School Science Teacher. In Proceedings of the Ninth International Conference of the Learning Sciences, Chicago, June 28-29, 2010. Honwad, S., Hmelo-Silver, C., Jordan, R., Eberbach, C., Gray, S., Sinha, S., Goel, A. K., Vattam, S., Rugaber, S., & Joyner, D. A. (2010). Connecting the Visible to the Invisible: Helping Middle School Students Understand Complex Ecosystem Processes. In Proceedings of the 32nd Annual Meeting of the Cogntive Science Society, Portland, Oregon. pp. 133-138. Hmelo-Silver, C., Sinha, S., Gray, S., Jordan, R., Honwad, S., Rugaber, S., Vattam, S., Goel, A. K., Ford, W., & Schmidt, C. (2010). Appropriating Conceptual Representations: A Case of Transfer in a Middle School Science Teacher. In Proceedings of the Annual Conference of the National Association for Research in Science Teaching, Philadelphia, PA. pp. 834-841. Goel, A. K., Vattam, S., Rugaber, S., Joyner, D. A., Hmelo-Silver, C., Jordan, R., Honwad, S., Gray, S., & Sinha, S. (2010). Learning Functional and Causal Abstractions of Classroom Aquaria. In Proceedings of the 32nd Annual Meeting of the Cogntive Science Society, Portland, Oregon. Vattam, S., Helms, M., & Goel, A. K. (2010). A Content Account of Creative Analogies in Biologically Inspired Design. AI for Engineering Design, Analysis and Manufacturing, Special Issue on Biologically Inspired Design , 24(4): pp. 467-481. Vattam, S., Helms, M., & Goel, A. K. (2010). Biologically Inspired Design: A Macrocognitive Account. In Proceedings of the ASME 2010 IDETC/CIE Conference, Volume 5: 22nd International Conference on Design Theory and Methodology, Montreal, Canada. pp. 129-138. Helms, M., Vattam, S., & Goel, A. K. (2010). The Effect of Functional Modeling on Understanding Complex Biological Systems. In Proceedings of the ASME 2010 IDETC/CIE Conference, Volume 5: 22nd International Conference on Design Theory and Methodology, Montreal, Canada. pp. 107-115. Goel, A. K., Jamnik, M., & Narayanan, N. H. (ed.). (2010). Diagrammatic Representation and Inference. Proceedings of the Sixth International Conference on the Theory and Application of Diagrams, Portland. Oregon. Lecture Notes on Artificial Intelligence #6170, Berlin: Springer. Goel, A. K., & Gomez de Silva Garza, A. (2010). AI in Design: An Overview. Guest Editorial, ASME Journal of Computing and Information Science in Engineering: Special Issue on AI in Design. 10(3), 030301. Goel, A. K., & Do, E. (2010). Design Computing and Cognition: An Introduction. Guest Editorial, AIEDAM Special Issue on Design Computing and Cognition, 24(1), pp. 1-2. Davies, J., Goel, A. K., & Nersessian, N. J. (2009). A computational model of visual analogies in design. Cognitive Systems Research, 10(3), 204-215. Jones, J., Parnin, C., Sinharoy, A., Rugaber, S., & Goel, A. K. (2009, September). Teleological software adaptation. In Self-Adaptive and Self-Organizing Systems, 2009. SASO'09. Third IEEE International Conference on (pp. 198-205). IEEE. Goel, A. K., Cheng, P. C., Clement, J. J., Dogan, F., Hegarty, M., & Nersessian, N. J. (2009). Visual Reasoning in Modeling and Design. In Proc, Thirty First Annual Meeting of the Cognitive Science Society, Amsterdam. Goel, A. K., Rugaber, S., & Vattam, S. (2009). Structure, behavior, and function of complex systems: The structure, behavior, and function modeling language. International Journal of AI in Engineering Design, Analysis and Manufacturing, Special Issue on Developing and Using Engineering Ontologies, 23: 23-35, 2009. Murdock, J. W., & Goel, A. K. (2008). Meta-case-based reasoning: self-improvement through self-understanding. Journal of Experimental & Theoretical Artificial Intelligence, 20(1), 1-36.